Welcome back to another edition of Technically Speaking, where our very own resident coach and former pro Rick Sewall takes a deeper look into the Revolution’s latest performance. Have any questions you’d like Rick to address? Let us know in the comments section below. What was the biggest issue behind the Revs’ offensive struggles? First, the Revs needed Chris Tierney’s crossing ability and his corner kicks, especially in-swingers (Lee Nguyen’s corner at the 86th minute surely needed a lot of improvement). The Revs didn’t have a natural left–footer on either wing for the entire match. Second, I would like to have seen Juan Agudelo and Charlie Davies (probably the Revs’ two major scoring threats) on the field together for longer than the 10 or so minutes they had. This two-barreled approach might have worked. Third, Lee Nguyen had a pretty good game, but opponents are paying more attention to him this year, getting in his way, often denying him the penetrating pass. As tough as it was for the Revs to create chances, their defense did well to prevent chances for Columbus. What did the Revs do effectively to contain the Crew? Rick: I give high praise to the back four of Darrius Barnes, Jose Goncalves, Andrew Farrell, and Kevin Alston, and to the defensive midfielders of Jermaine Jones (Andy Dorman in the second half) and Scott Caldwell. Anytime your defense is able to keep a strong opponent from getting a shot on goal for a whole game is darned good work. Farrell, the man of the match (and deservedly so) had his best game. His ball possession skills (passing and dribbling) are improving, and if he had more confidence in his shot on goal, he would be on the way to becoming a complete player. Even though Bobby Shuttleworth didn’t have to make any stops, he showed his value to the Revs when he snatched the ball off Aaron Schoenfeld’s chest in the 94th minute. Bobby is always focused. It was nice to see Diego Fagundez stuff Frederico Higuain defensively in the second half and then make a very nice pass to Charlie Davies. How much stock do you put into the wind’s impact on the game? Rick: This game reminded me of the Kansas City-Revs tussle of two years ago – another 0-0 tie, played under conditions similar to those on Saturday. Any time you combine a lot of wind with artificial turf, the game will be made more difficult for players. The ball will all too frequently roll out of control, making it difficult to pass it with the proper pace. In general, bad field conditions – whether from wind, rain, extreme temperatures – work to the disadvantage of the favored team. They have a neutralizing effect. In this particular match-up, I would say the wind helped the Revs, because through the course of the game – especially the first half hour – the Crew were the better team. 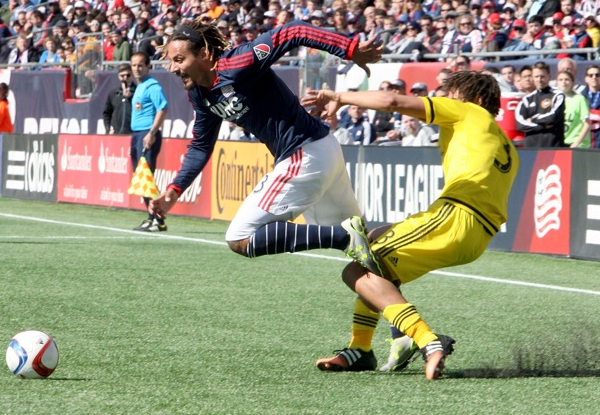 How do you think Jermaine Jones performed during his first 45 minutes of the season? Rick: Jermaine put in a steady, error-free performance for the first 45 minutes. I would say he is 80 to 85% of the way back from his February operation. His best play was the pass to Teal Bunbury in the penalty area. It’s great to have him back – they need his captaining influence at midfield badly. What stood out the most to you from Saturday’s game? Rick: First, these are two very evenly-matched teams. Both have three to four players who would be sure starters for the other team; Nguyen, Agudelo, Jones, and Shuttleworth could easily start for Crew; Kamara, Higuain, Tshani, and Parkhurst for the Revs. I would be very surprised if either team failed to make the playoffs. Second, the Revs see themselves as a team that plays possession soccer, so I was surprised and a little depressed that they had so little of the ball for about the first half hour. They played the Crew on fairly even terms for the remainder of the game, but one could argue that this first half-hour lapse (one third of the game) cost the Revs dearly. Third, any time I see a game played in these conditions, involving both weather and an artificial-turf playing surface, I long for a soccer-specific 27,000-seat stadium with a full-sized natural grass field, protected from wind as much as possible. I am wondering your thoughts on whether Rowe is miscast in a wide role? Yes he has some good even jaw dropping moments and that is undeniable. However more often than not I feel he is not in a position that plays to his strengths and goes missing for games at a time. While a player like Bunbury or even fagundez have skill sets that can adapt out on the outside I don’t feel Rowe is a good fit there. It is probably a case of heaps wanting to get the best players out there. Is that always the best approach put what you feel is the most talent on the pitch even in a less than ideal way or the best players for the style you want to play even if you have to admit some talented ones? I’m wondering a bit what you would do given the opportunity with the players we have now. What would be your formation and lineup to take advantage of the players on this team? At some point it also would be nice to have your opinion on sticking with a formation/style of play no matter the personnel or situation and what the best way to build a team is, around system or talent available? Help! BWG, you are putting me to work, but I appreciate your questions. Kelyn Rowe had a forgettable game Saturday, and if anything will keep Jay Heaps from getting a good night’s sleep it’s problems like Kelyn’s and other coaching puzzles you have brought up in your comment. I agree with you that Kelyn’s best position is not as a winger. He is not the type of player who can really challenge a back on the dribble towards the goal or the end line before crossing, a quality I feel all wingers ideally should have. I feel he is most effective as an offensive midfielder (with defensive responsibilities) in a 4-1-4-1 formation, playing next to Lee Nguyen, maybe a little deeper. Kelyn loves to be closely involved in the flow of play, has a high work rate and loves to mix it up. He is also is adept at getting the ball to a spot where he can shoot on goal. Currently on the Revs there are eight field players who , generally ,could be considered to be starters- Farrell, Goncalves, Tierney, Jones, Nguyen, Agudelo, Davies, and Bunbury (when he returns to the form he had last fall). Borderline starters (they may or may not start) are Rowe, Barnes , Alston, Dorman, and Caldwell- notice that Scott, who has been a consistent starter, may not be starting in the 4-1-4-1 formation I have suggested. Kelyn, because of his scoring talents, may be. Playing formations and starting personnel frequently change from week to week- a lot depends on your opponent and many other factors- the weather, injury situations, playing home or away, etc. One reason why Bunbury started Saturday was because Heaps felt the team needed a good tracking winger, fearing the attacking threat posed by the Crew outside backs. So, it is difficult for me or for almost any coach to rely on a set formation or line up. The only way this would be possible would be if you had 11 superior players and a good balance of defensive, midfield, and forward players. I strongly believe on building a team around the talent available, not around a system or formation. I would try to identify the best players and put them on the field in a spot that would highlight their strengths and cover up their weaknesses, almost letting the formation form itself naturally. I have seen college teams be very successful for many years then, because the coach was stubborn and unwilling to change his system, he would start having losing seasons because the game passed him by. Coach Heaps , on the other hand, seems to very flexible , willing to change starting personnel and formations. This quality is nothing but good for the Revs. Thanks tons Rick and I aplogize about the length and number of questions. I really appreciate the time you put into your answer as well as the depth of reply. I thought it very interesting and great to get your perspective and to learn from it In the future I’ll narrow the question list but in the interim please keep up the column I enjoy it very much. BWG–your questions were excellent, and please don’t hesitate to ask more in the future. Believe me, I enjoy responding. The more challenging the questions, the more welcome! Rick Sewall played four years at Yale University (1961 to 1965), nine years semi-pro for New Haven City (1966 to 1974), three years on the Connecticut Senior All-Star team (1972 to 1974), one year for the Boston Minutemen (1975), three years for Framingham Belenenses (LASA League, 1980 to 1982), and many years of over-30 and over-40. He has coached at all levels from kindergarten through college, including Boston Latin High School from 1986 to 1999 and girls’ club soccer from 1991 to 2005 (including two Mass. state championships) and runs camps and clinics focusing on technical training. A USSF B licensed coach, he was taught by, played with, and has coached with and for Hubert Vogelsinger, his primary soccer mentor, for over 40 years.